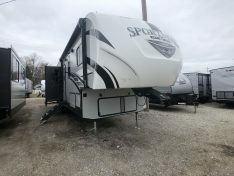 The KZ Sportsmen Sportster 100 Travel Trailers and Sportster Toy Haulers offer an extensive array of Floorplans to meet all that your adventurous RV lifestyle demands. All Sportsters include K-Z’s 2 Year Warranty, offering the assurance that KZ RV stands behind what it builds. Built 100″ wide to give you the room you need for your toys. 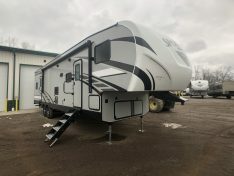 Interior features 5/8″ tongue and groove floor construction, residential crack resistant linoleum, seamless countertops with under-mount kitchen sink and blue interior LED lighting. 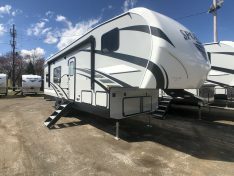 Incredible features and options combine into a truly affordable Toy Hauler. Well Designed kitchen areas feature overhead storage, microwaves, and drop in cooktops with glass range covers. No matter the floor plan, you can count on KZ to deliver maximum use of space to make your Toy Hauling camper experience more pleasurable.